Manchester United’s 1-0 victory at home to Bournemouth on Wednesday evening saw Luke Shaw and Scott McTominay making their first Premier League starts of the season. The 21-year-old centre midfielder started in place of the suspended Paul Pogba, with Marouane Fellaini and Michael Carrick both out injured, and Ander Herrera dropping to the bench. 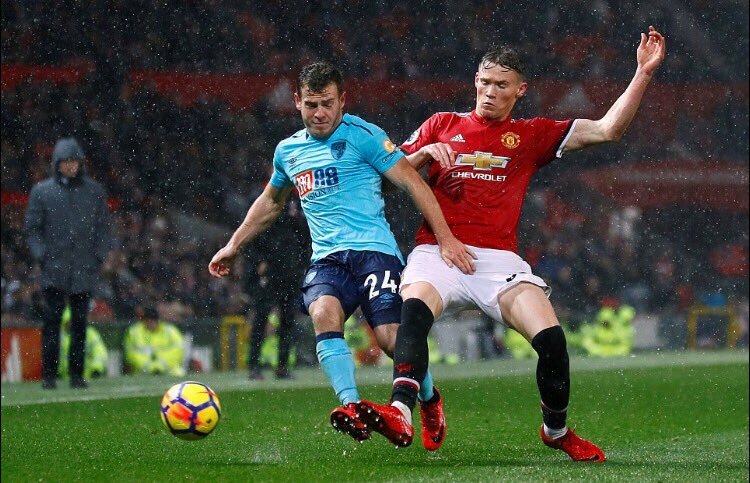 McTominay’s only previous Premier League start came on the final game of last season against Crystal Palace as Jose Mourinho rotated his side with the Europa League final in mind the following week. The 6’4″ youth academy product has made one start and two substitute appearances in the Champions League this season and made a further start and substitute appearance in the EFL Cup. Scott McTominay was starting alongside the experienced and talented Nemanja Matic against Bournemouth’s five-man midfield and didn’t look out of place at all, showing great composure for a player of his age and relative lack of experience. “Scott [McTominay] didn’t look like it was any different for him to play in another match and another competition. He is ready to play, he had 90 minutes today, he had 90 minutes against CSKA [Moscow] and he is ready to play. Paul Pogba will sit out the final game of his three-match ban at West Bromwich Albion this weekend, but McTominay could lose his place to Ander Herrera at the Hawthorns with the Spaniard being rested on Wednesday. Marouane Fellaini is also believed to be closing in on his return.